The empty nest is often spoken about as a sad and lonely time. The kids leave and take all the life and interest and excitement with them. There's no-one left who needs looking after, nobody coming and going, no strangers wandering through the house, nothing new and nothing out of the ordinary any more. It can all be so silent and sedate and fairly boring if you let it. Our house is certainly emptier and quieter without adult kids at home, but I also don't lie in bed at night waiting to hear the front door close to know they're home. I don't worry when I hear police sirens in the distance - I know they're not chasing my son in his speeding car or attending to a crash they might have been in (the constant worry of a mother who has teenage drivers at home). I don't have to think about how many I'm feeding at dinner time - there's always just the two of us and my husband has taken over most of the cooking lately so that is a bonus too. Kids are really good at making the transition from nestling to full flight. It would be such a shame to spoil it for them by being lost, and lonely, and needy, and trying to cling onto their tail feathers as they zoom off to a new life. We found it was easier to make the transition as painless as possible, to wish them all the best, give them any help they needed to launch and to let them know we were there if they needed us. Then it was up to us to reconnect, restructure, and restart being a couple again - and it has been a lot better than I anticipated. When you let your kids go without a struggle, they are happy to return for visits. They see themselves as separate entities who are free to come and go without any angst on their parents' behalf. It's a joy to see them come home and be settled in so quickly and easily, and for their spouses to feel part of the family too. It's lovely to have them and it's lovely to say goodbye and have peace descend again. Our empty nest isn't the cobwebbed pile of sticks you see in pictures, it is green and flourishing and feathered and ready at any time for whatever comes along. How fantastic is that?! 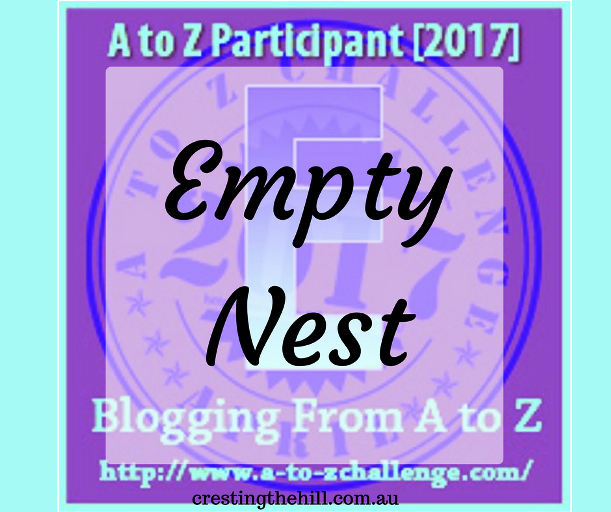 If you'd like to read more about Loving an Empty Nest you can go HERE or HERE. See you tomorrow for F - which is for the Lifelong Friendships. I like your thoughts on letting go of your kids. It's exactly how I feel about it too. Most Indian parents never really let their kids make that transition. I see adults all around me who haven't quite "grown up". My twins are 17 so I'm creeping towards the empty nest! This post is such good advice. I love that quote by the Dalai Lama. To me it summarises what parenting is all about. 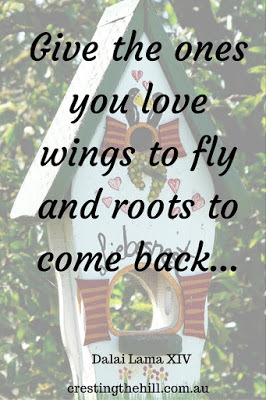 Giving your children the wings to fly and the roots to come back is surely the goal of parenting! Love the quote by the Dalai Lama. Always hard to see your children move out, but so nice to see them come home too. Nice post. My parents let me go when I was 21 --- 12 years ago and then about 5 years ago, they let my sister go. I do worry about them sometimes as they've let us go to different countries but at the same time, I hope now they can actually do things for themselves as we are adults. You've expressed my view on the role/duty link on the parent/child spectrum perfectly. We choose to have children and so it is our duty to do our best for them, including preparing them for an independent life, whilst ensuring they know we have their back (always). Having children only to make them feel duty bound to not just care for you in your old age, but also to provide you with all your company and entertainment, that's irresponsible parenting, in my book. I was brought up by an anglo-Indian mother, so it's something I feel very strongly about. The greatest gift my daughter has ever given me was to express the wish that she will be the same mother to her about-to-be-born child that I was to her. My husband dreaded the day our youngest would leave, and I kept assuring him that having an empty nest was going to be great. And it has been. We have times when we wish our kids were still little and sitting around our table, but we are thriving in this stage of our lives. My brother is currently planning to 'empty' the nest. It worries me how my mom dad will survive. I guess, I will take pic of your blog post and send to my mom! When my youngest moved out I cried for weeks. However, he only moved 2 miles away. Both my sons and their family's lived within a three mile radius. After a decade, Husband and I needed to run away from home. We found that our retirement had become too meshed with their lives and we needed to strike out on our own. Now my sons are dealing with a reverse version of the empty nest. 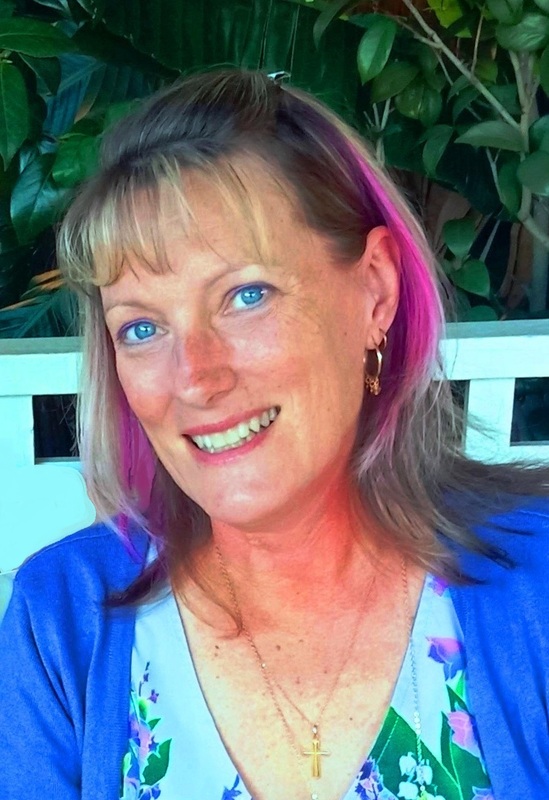 With your blog, I am seeing so many bright side of the middle age! And deep in my heart, I'm not scared of it as well! My daughter is 19 and threatens to buy the house next door so she'll never be far from us! I'd love to see her spread her wings & fly, but at the same time I wonder if she's actually ready...Does every parent feel that way? Congrats on the husband who cooks! Mine does breakfast occasionally, but works unpredictable hours so I can't count on him to be there to eat dinner with me, let alone fix it! Life keeps changing and the better we are at accepting change the happier we become. Glad you're a Happy Empty Nester. It sounds like you've fully embraced the change. That's wonderful! I admire your ability to let go and move on. I'm probably going to have a hard time. Then again I'm not a helicopter Mom today, so I may just manage to keep it to myself how hard it is to see my baby leave the nest. Oh, I just had a thought: I may occupy his room and turn it into a writer's and crafting studio!!! Ha! My 17 year old will soon move to Korea for 3 months. On a modelling assignment. I love that we have helped her create these opportunities. But there is a pain in my bellybutton where the umbilical cord is finally detaching .... (sob).